The company’s main line extends approximately 84.2 miles between the towns of Moccasin and Geraldine, and the line connects with the BNSF Railway at Moccasin. 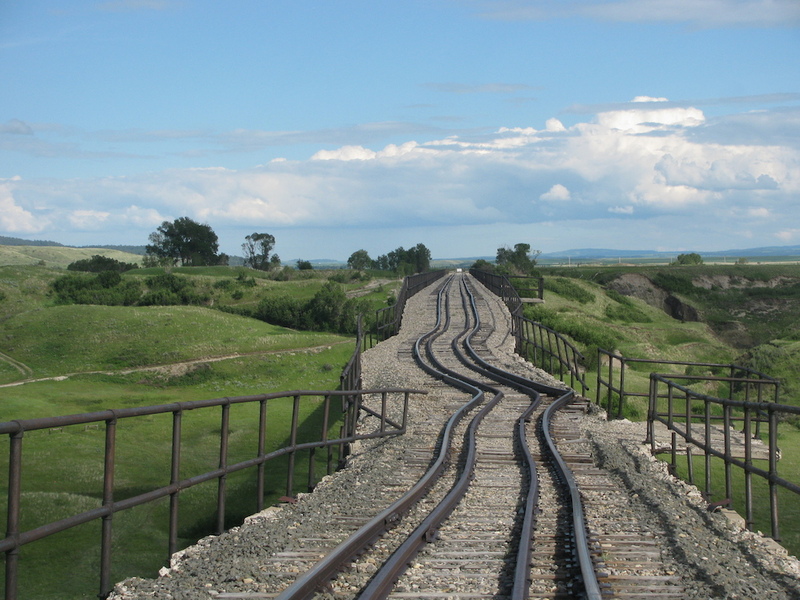 Most of the current Central Montana track was originally constructed by the Chicago, Milwaukee, St. Paul and Pacific Railroad, as part of its “Northern Montana” line to Great Falls. The southern miles of line, from Moccasin to Kingston Junction, were originally constructed by the Great Northern Railway as part of its Lewistown branch. There are few iconic locations like this in the state where rail lines, scenery, and structures converge into unprecedented scenes. The overall line features four massive steel trestles and a 2,000-foot-long tunnel. Idle since the 1980s, this track includes the massive 1,000 foot long wooden Spring Creek Trestle, just east of Spring Creek Junction. Although it no longer serves traffic, it remains one of the largest wooden structures of its type still in existence. In 2011, flood waters twisted and severely damaged the 100-year-old, 2,000 foot long Judith River Trestle undermining 8 concrete foundation piers and cutting off access to move the 1,000 cars of grain that the small railroad company hauls each year with its six locomotives. Four million dollars in federal grants restored it back to service in the fall of 2014. Though primarily a freight railroad, the Central Montana also operates a seasonal dinner train, the “Charlie Russell Chew Choo,” between Kingston Junction (10 miles northwest of Lewistown) and Denton. The dinner train equipment consists of unpowered Budd Rail Diesel Cars originally built for the Boston and Maine Railroad.